Watch the world premiere of Chris Braak's play "Empress of the Moon" livestream tonight! 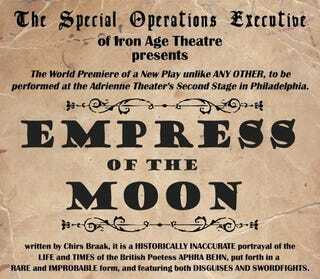 Tonight at 8 PM EST, we'll be hosting the livestream of io9 contributor Chris Braak's new play The Empress of the Moon. It's an alternate history about the life of writer and spy Aphra Behn, featuring lots of swordfights. You can read more about the play here. We'll be starting up the livestream for technical checks around 7:45, and then if all goes well you should be able to watch the action unfold between 8-10 EST. The play is happening in fleshspace at Philadelphia's awesome Iron Age Theater. Watch the world premiere of "Empress of the Moon" on io9! If you are being prompted for a password, just type in "aphra" (without quotes).